Our slogan tells you what the Eagles are all about. We are...... "People Helping People." 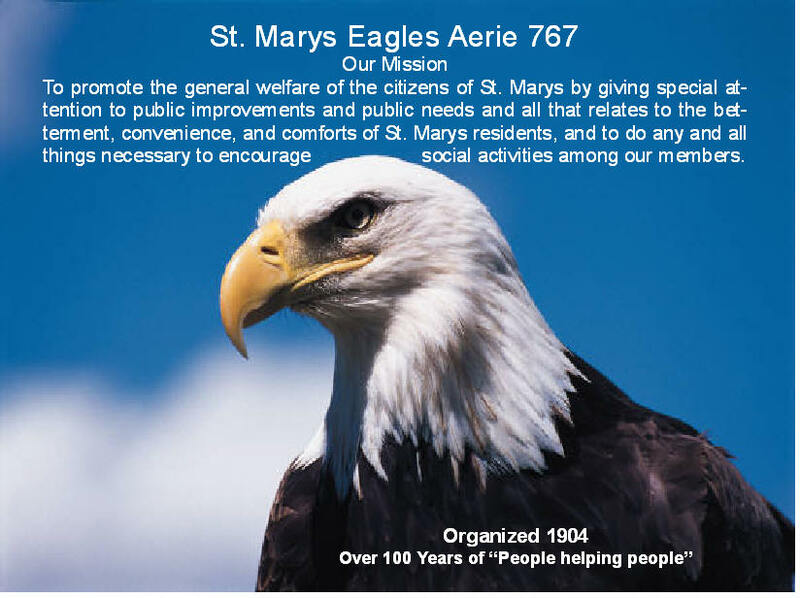 The St. Marys Eagles Aerie 767 was organized June 30, 1904, with 93 charter members. We presently have more than 1,900 Aerie and Auxiliary members who continue to uphold the Fraternal Order of Eagles' traditional values of home, family, community. We donate thousands of dollars and other services each year to charities, civic events, school and youth activities, and other worthwhile causes, a result of many hours of work by many members who ask nothing in return, always working toward the betterment of our community. We truly believe that today’s youth are tomorrow’s leaders, and eagerly support our young people in many ways. We support and sponsor numerous local youth programs and activities, such as sports teams, reading and writing programs, drug awareness, scouting, author visits, scholarships, and many others. Anyone interested in Eagle programs or membership is welcome to visit our Aerie. The Fraternal Order of Eagles are “People Helping People”. Send mail to eaglelodge@bright.net with questions or comments about this web site.